Award-winning philanthropic program helps thousands of Guatemalan families. 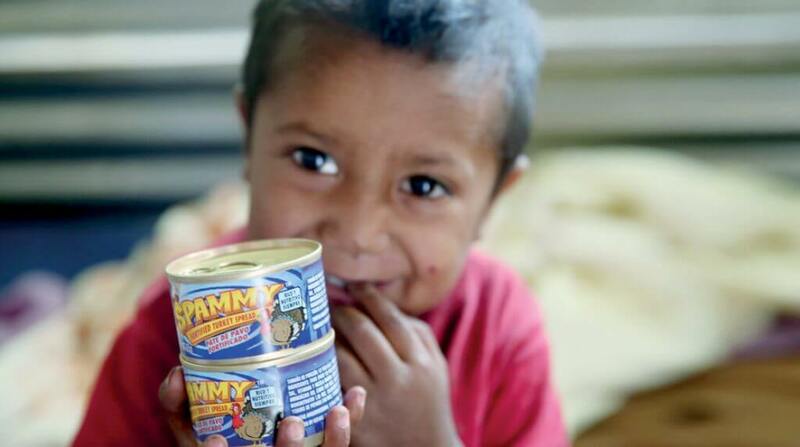 AUSTIN, Minn., December 10, 2018 /3BL Media/ - December marks the 10th anniversary of Hormel Foods Corporation’s (NYSE: HRL) first shipment of SPAMMY®, a shelf-stable poultry product fortified with vitamins and minerals the company developed to help prevent childhood malnutrition in Guatemala. Hormel Foods donates more than 2 million cans of SPAMMY® each year, which helps thousands of families. In addition to the company’s product donations, the program consists of education and engagement components. Hormel Foods has helped open more than 20 chispa centers where children develop skills at six stations: English, computer, psychomotor development, arts and crafts, imagination and sports. Each year, the company hosts engagement trips for its team members to learn more about the program and to help out. In addition, the company and its employees have provided several scholarships to help further the education of children. To commemorate the 10th anniversary, the company is holding a Project SPAMMY® Week. During the week, the 2019 employee engagement trip opportunities will be announced, and stories and videos about Project SPAMMY® and its impact will be showcased. An employee fundraising drive is also taking place to help raise additional funds for scholarships and chispa center supplies. For more information about Project SPAMMY® and the company’s philanthropic efforts, please visit https://csr.hormelfoods.com/communities/.